17 of us squeezed in our last minute venue – Forest Gate Arts, with an agenda that was equally packed and interesting. 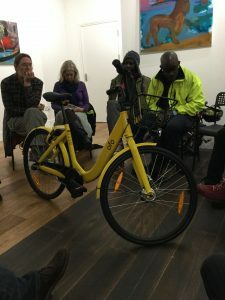 Dockless Bike Hire: Fraser from Ofo bikes spoke to us about the company, their bikes and the dockless system, their plans, and their discussions with Newham Council with a view to introducing them into the borough. We were even able to try one out! The company is a partner of LCC and ultimately plans 150,000 bikes in London, starting in Islington and Hackney and focusing on surrounding boroughs. Newham is therefore a natural point of expansion. Sad news: The bike shop Pave Velo has closed in the QE Olympic Park. Ambition, Aspire, Achieve: we plan to go forward with this partnership by providing bike fixing stalls at the children’s cycle club on 17 February, 28 April and 26 May with short Greenway based rides on the weks following – 24 February, 5 May and 2 June. These are all Saturdays between 10am and 1pm. If you are able to help (and haven’t already volunteered) please let me know. Forest Gate to Wanstead Link: This is a new subject. Given how appalling Centre Rd is, it is difficult to cycle directly to Wanstead from Forest Gate. We decided to do some preliminary investigation, by a ride of the route; and also to see if there is a group in Redbridge who would be interested in pursuing this with us. Bike from Boleyn: Next ride is April 14. Although this is some way off marshals are needed. So if you can help put this date in your diary and let me know. Stratford Gyratory: an audit of the works was undertaken with Newham Council’s project manager, the Met Police Safety Unit and Michael Barratt, TfL’s Development Impact Assessment Lead, who promotes innovative methods to mitigate the impact of major construction projects. His subsequent report highlights the various “hotspots” and recommends what can be done to mitigate. The main action point for us is to lobby the constructors who are taking up disproportionate space in Great Eastern Street (which is separate to Gyratory project). We agreed to invite Michael to our next meeting. The audit could usefully be repeated in a few months. Liveable Neighbourhoods: This is the focus of LCC election campaign. It involves identifying at least one good project for local groups to push for in the next round of applications for TfL funding. Newham Council has so far not made any applications. In preliminary discussions a number of potential schemes were identified which could be part of a future campaign. This will need to be picked up as it becomes clearer who the local candidates are likely to be. Olawale is attending a workshop on the broader campaign for Liveable Neighbourhoods. Ultra-Low Emission Zone: We agreed to respond to the current TfL consultation, pushing for more stringent measures – quicker. Annual meeting: This will take place on 30 April.